A board portal is a secure, cloud-based document sharing solution where executives can share financial, legal, HR, market analysis and IP documentation with their boards. It acts as a corporate repository that enables secure, organized and trackable content sharing with anyone, anywhere, at anytime. Why use a Board Portal? The ShareVault Board Portal is more cost effective and secure than other board communication solutions, while offering features that simplify and streamline board collaboration. Today’s organizations are faced with an increase in both volume and complexity of compliance standards coupled with a surge of security risk. When sharing sensitive documents with board members, it’s essential to minimize the risk that information falls into the wrong hands. With the ShareVault Board Portal, organizations have enterprise-level security. Document control features enable executives to set different document security policies, add watermarking, prevent screenshots and printing and even revoke access to a document after it has been downloaded. 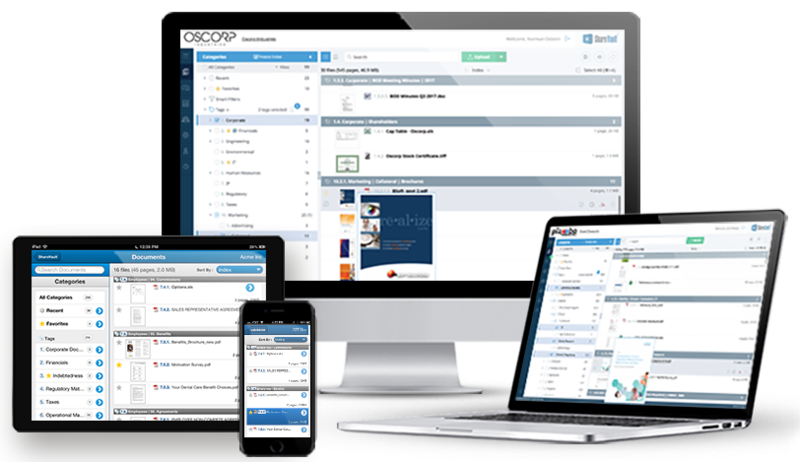 Executives benefit from organization tools to quickly batch upload, share and create a content hierarchy that simplifies document sharing across devices. While board members can easily navigate and access the documents they need to make informed decisions. Board members have different goals and perspectives and often require varied levels of communication. ShareVault offers executives visibility into how long and which documents board members have accessed prior to the board meeting. This helps the executive team better prepare for board meetings and anticipate questions. It also educates board members on the context required for the meeting, based on the level of engagement in the ShareVault Board Portal. No matter the enterprise or location, all board meeting participants enjoy easy and immediate access to the meeting’s agenda and all relevant meeting documents, from the comfort of their laptops and mobile devices. As a result, participants come to meetings more informed and better prepared, board and management teams are more effective and they enjoy a healthier and more productive relationship. With ShareVault’s Board Portal, simpler is better.